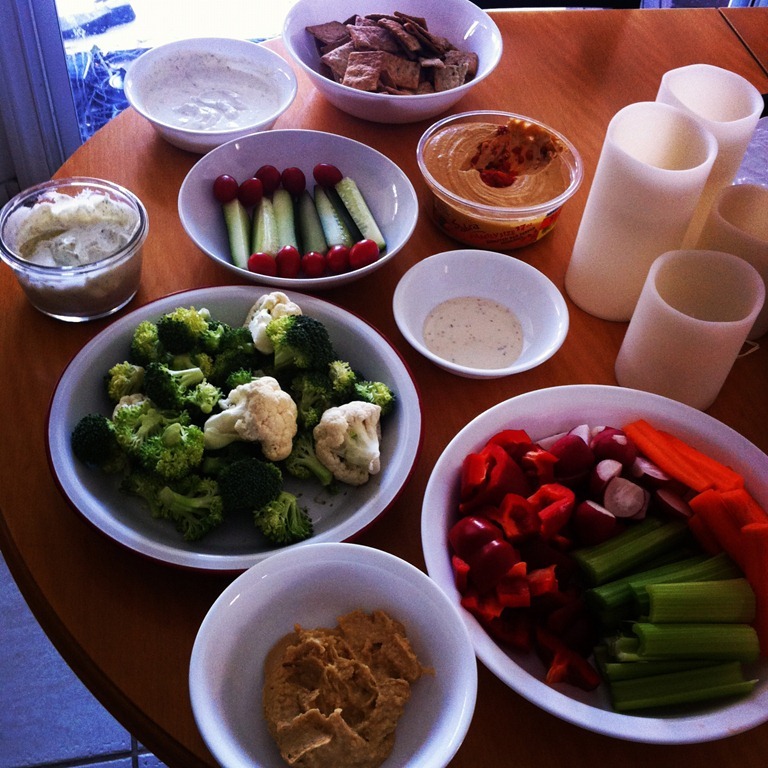 To celebrate the second biggest consumption day of the year, I made a huge spread of veggies, chips, and dips! I’m not surprised that Americans eat almost as much today as they do on Thanksgiving. I’m pretty sure that overeating turkey and side dishes is a BIT healthier than pigging out on chips, dip, and burgers! I tried to make sure that today’s indulgence was as healthy as possible. I picked up a selection of veggies and unique chips at Fresh and Easy and Trader Joes. I love those two stores! 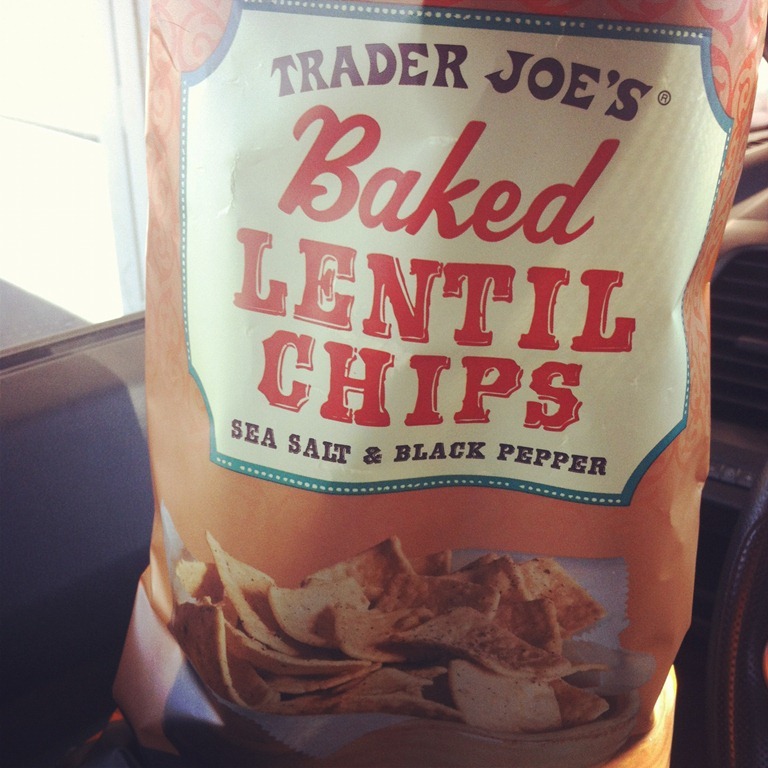 Check out the baked lentil chips I found at TJ’s! They were incredibly tasty! Only 120 calories per serving with a few grams of protein and fiber to make the crunch have staying power. I could munch on these all day and not feel TOO guilty! Bring on the beans! I made two great dips. One was a simple green onion dip, but instead of using sour cream, I mixed seasonings into a cup of plain fat free greek yogurt. Creamy! Protein-y! I made a batch the traditional way with sour cream to satisfy picky tastes. Colby liked both versions, but my mom said the sour cream based one was significantly tastier. Try it out for yourself! 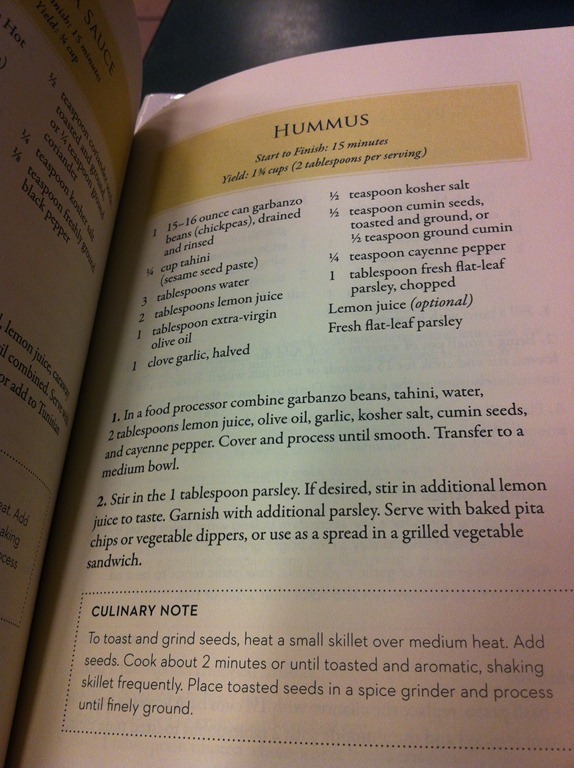 The second dip I made was adapted from The New Sonoma Diet book. I didn’t have tahini on hand, but I didn’t miss it. 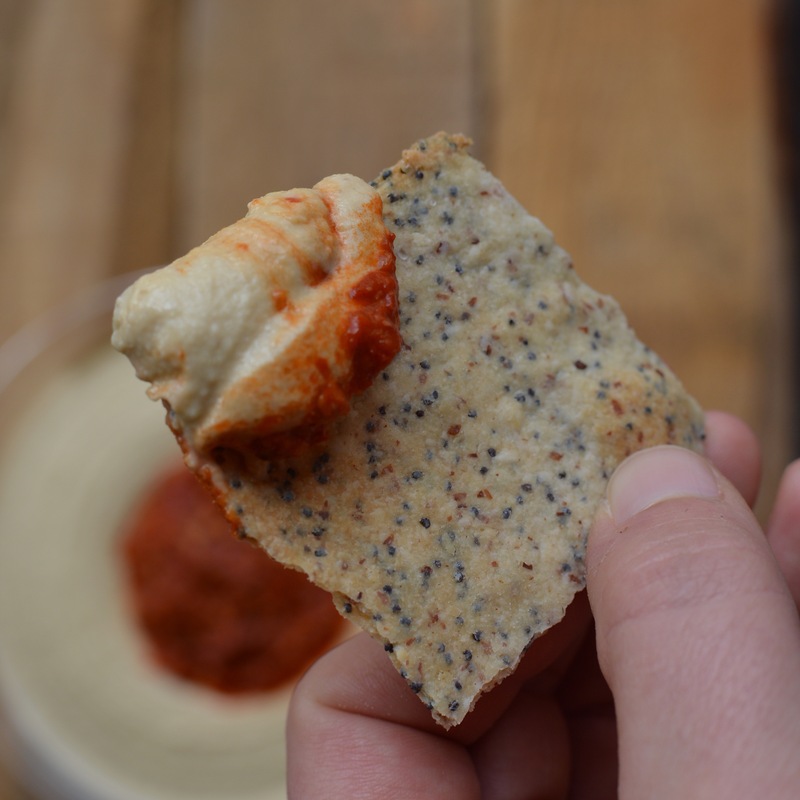 The hummus was spectacular and SO easy to make! Just get the ingredients together, and blend till smooth! 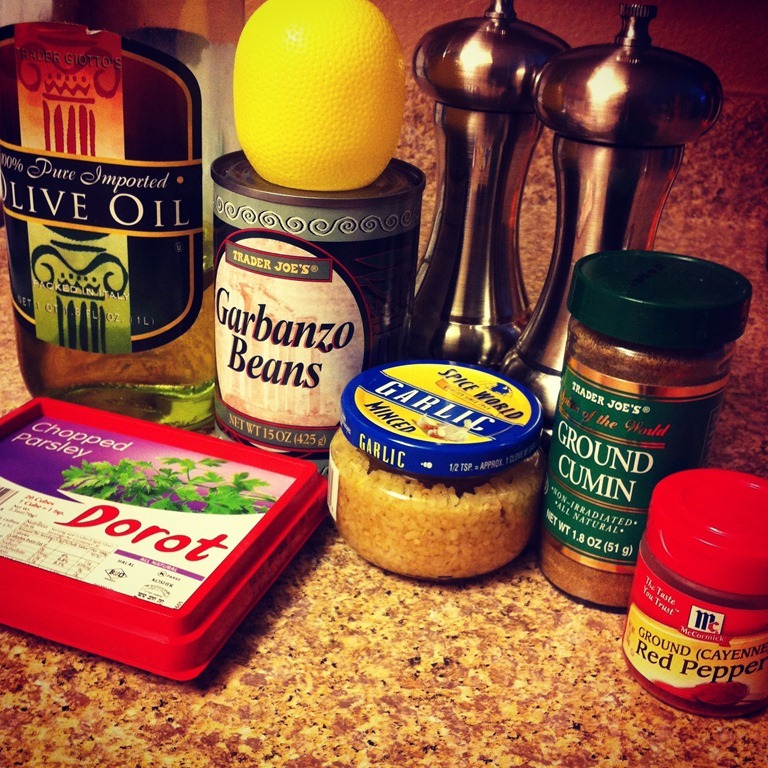 Garbanzo beans make hummus so creamy and rich that you only need a tiny bit of olive oil for flavor. Lentil chips with hummus dip might be overkill, but I say BRING ON THE BEANS!! Happy dipping! The flavor variety of 8 different veggies, multigrain pita chips, lentil chips, and 5 dipping sauces really hit the spot. The only things I really wish I had now are 3D Doritos and Pizza Rolls. Remember 3D Doritos?? Bring em back, seriously! It would be nice to have my sister here to enjoy those with. We used to chow down on Totino’s and other snack foods whenever we had the house to ourselves for an evening. Good times! Did you watch the Super Bowl? Did you like the half time show? What did you think of the commercials?